Disabled workers at a chalk factory in Ghana's capital, Accra. Today’s International Day marks the official launch of preparations for the High-Level Meeting, which will take place in September at UN Headquarters in New York, and build on development targets world governments are setting to succeed the anti-poverty agenda enshrined in the 2000-2015 Millennium Development Goals (MDGs). “This gathering will take place as the international community works to forge a post-2015 development agenda, presenting an opportunity to ensure that the rights, concerns and contributions of persons with disabilities are fully taken into account,” Mr. Ban said. More than one billion people – about 15 per cent of the world’s population – live with some form of disability. The UN has promoted an International Day on behalf of the disabled since 1992, when the General Assembly recognized the International Day of Disabled Persons, changing its name to the present one in 2007. It was also in 2007 that the UN Convention on the Rights of Persons with Disabilities opened for signature. Entering into force in 2008, the Convention recognizes the barriers disabled people face are a central component of their respective disabilities and, because of that, it says that disabled people have fundamental rights to both accessibility and inclusion. As of last month, 126 countries, representing two-thirds of UN Member States, had ratified the Convention. Saying that the international community must “strive to achieve” the Convention’s goals, Mr. Ban noted that this summer’s UN Conference on Sustainable Development (Rio+20), which took place in Brazil, had already highlighted that – as they searched for a formula for a “sustainable” future in which human needs are met through resource-use that preserves the environment. “Our challenge is to provide all people with the equality of access they need and deserve,” Mr. Ban said. “This year’s Paralympic Games were a reminder of the immense potential of persons with disabilities to soar and to inspire,” Mr. Ban noted, citing the international multi-sport competition that took place in London this year, and which coincide with the Olympic Games every four years. The UN chief also used his message to salute the American musical performer Stevie Wonder for his work behalf of the world’s disabled. Mr. Wonder, himself blind since shortly after birth, has served as UN Messenger of Peace since 2009. 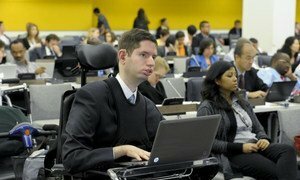 Hundreds of advocates and experts on disability, as well as Government delegates, have gathered at UN Headquarters for the start of the Fifth Session of the Conference of States Parties to the Convention on the Rights of Persons with Disabilities (CRPD), which will have a special focus on women and children.